DC Password And Encrypted Data Manager Doc - Categories - Douglas Computing, Inc. 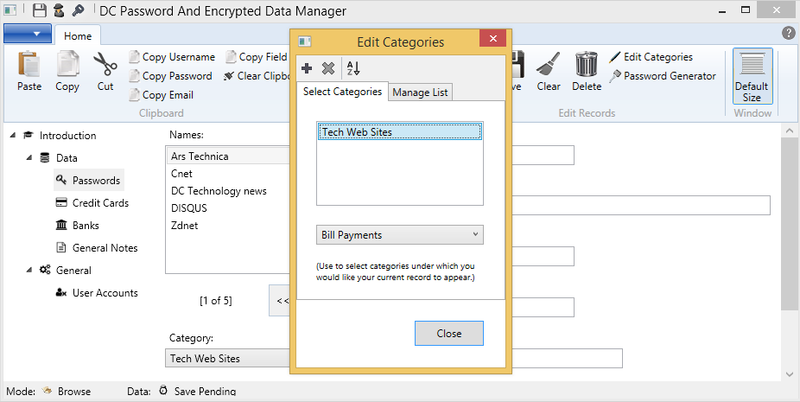 The DC Password And Encrypted Data Manager, allows you to create and assign categories to Passwords and General Notes records. This allows you to group these records a variety of ways, for better organization and improved efficiency. 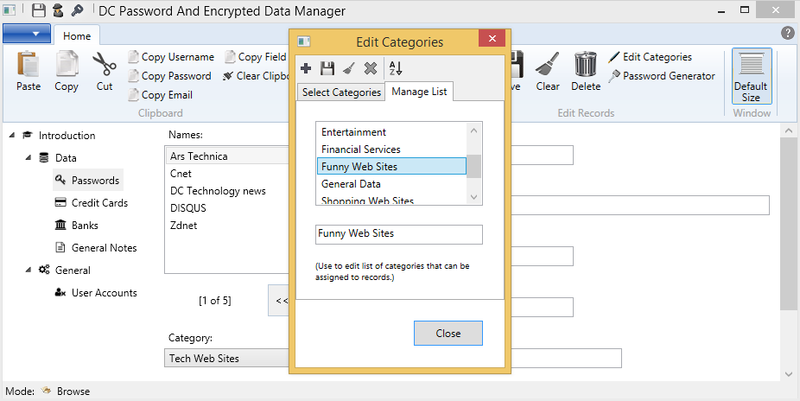 For example, if you create a category called Tech Web Sites, then assign it to Passwords records with the names Ars Technica, Cnet, Zdnet, etc., when you select the category Tech Web Sites in the Category combo box below the Names list box in the Passwords section of the application, only these records will appear in the application. Not only can you assign a single category to a Passwords or General Notes record, you can assign an unlimited amount. This allows e.g. a Passwords record to appear under several categories of records. To create a list of categories, after selecting either Passwords or General Notes on the navigation tree to the left of the screen, click on the Edit Categories button on the ribbon bar. Next, click on the Manage List tab in the resulting dialog box. To add a new category, click on the Add button on the toolbar for the dialog box. This clears away any category which may be found in the text box below the list box, which lists the categories that are available for assignment to the Passwords or General Notes records you are in. Next, type in a new category into the text box below the list box displayed in the dialog box. Next, click on the Save button on the toolbar for the dialog box, to save the category you just added. If you want, you may click on the Sort button on the toolbar for the dialog box, to sort the category values in the list box. Note: if after beginning to add a new category to your list, you decide against it, you may click on the Clear button on the toolbar for the dialog box, instead of the Save button, to clear away your effort to add a new category. To edit a category present in the list box under the Manage List tab for the Edit Categories dialog box, select the category in the list box, and simply edit the category in the text box below the list box. After you are done, click on the Save button on the toolbar for the dialog box, to save the category you just modified. Note: if after beginning to edit a category in your list, you decide against it, you may click on the Clear button on the toolbar for the dialog box, instead of the Save button, to clear away your effort to edit your category. Note: when you edit a category, all Passwords or General Notes records that were previously assigned the category, will be automatically updated with the edited value of the category. To delete a category present in the list box under the Manage List tab for the Edit Categories dialog box, select the category in the list box, and simply click on the Delete button on the toolbar for the dialog box. Clicking on the Yes button in the resulting confirmation dialog box, will result in the category you selected in the list box, being deleted. Note: when you delete a category, all Passwords or General Notes records that were previously assigned the category, will be automatically updated with the category being deleted from the records. After adding the categories you would like to be able to assign to your Passwords or General Notes records, you can focus on selecting one or more of them to be assigned to a particular Passwords or General Notes record. To select one or more categories for assignment to a Passwords or General Notes record, navigate to the Passwords or General Notes record in the main screen of the application, then click on the Edit Categories button on the ribbon bar. Next, select the category in the combo box, below the list box (under the Select Categories tab, in the resulting dialog box) you would like to assign to your Passwords or General Notes record. Then click on the Add button on the toolbar for the dialog box. To select another category for assignment to your Passwords or General Notes record, select the category from the combo box below the list box, then click once more on the Add button on the toolbar for the dialog box. If you selected a category and would like to delete it from the list box, select the category in the list box, then click on the Delete button on the toolbar for the dialog box. Click Yes on the resulting confirmation dialog box, to go ahead with your deletion.